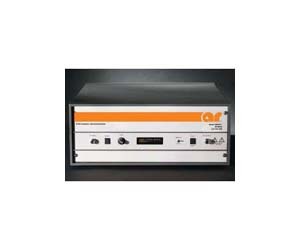 The Model 20S4G11A is a solid state, self-contained, air-cooled, broadband amplifier designed for applications where instantaneous bandwidth and high gain are required. Housed in a stylish contemporary cabinet, the unit is designed for benchtop use, but can be removed from the cabinet for immediate equipment rack mounting. The 20S4G11A, when used with a sweep generator, will provide a minimum of 20 watts of RF power. Included is a front panel gain control which permits the operator to conveniently set the desired output level. The 20S4G11A is protected from RF input overdrive by an RF input leveling circuit which controls the RF input level to the RF amplifier first stage when the RF input level is increased above 0 dBm. The RF amplifier stages are protected from over temperature by removing the DC voltage to them if an over temperature condition occurs due to cooling blockage or fan failure. There is a digital display on the front panel to indicate the operate status and fault conditions when an overtemperature or power supply fault has occurred. The unit can be returned to operate when the condition has been cleared. The 20S4G11A includes digital control for both local and remote control of the amplifier. The control system is composed of a 16-bit RISC microcontroller board which handles primary functions of the amplifier and interprets commands sent to it from an 8-bit remote interface board. This 8-bit microprocessor controlled board provides both IEEE-488 (GPIB) and asynchronous, full duplex RS-232 control of all amplifier functions. The Model 20S4G11A is housed in a cabinet and designed to provide standalone performance for RF testing. It is also configured to be used as a sub-amplifier in a 40 watt, 60 watt, or 80 watt higher power amplifiers. It can be added to in an incremental fashion to become a part of these higher power units, yet still be used as a standalone 20-watt amplifier. The RF output connector must be configured to the rear panel to be used as a sub-amplifier.